Almost 4 hours of instrumental guitar presented in a wonderful 3 CD set! From solo guitar to upbeat mini ensemble tracks , Bill Perry's music is very melodic , often gentle and relaxing ... the perfect antidote to today's stressful world! New Hampshire native Bill Perry has a long history as a performing musician and teacher. After leaving music behind for 20 years, he returned to the guitar in 2002 and has produced three well-received instrumental albums. Guitar Journeys is the latest of these, a hefty three-disc set with 40 originals. Perry plays many pieces solo on nylon-string guitars, although he adds steel stringed instruments - both six and 12-string guitars - on a number of tracks. Most of his compositions feature lyrical melodies, effectively rendered without a lot of ornamentation. "Forever" is but one of many examples of Perry's melodic sense. Many of his pieces remind me of late 1970s and early 1980s popular music. For instance, on "Into my Own", his pulsing pedal bass notes recall pop anthems that saturated album-oriented radio in that period. Perry's spiritual interests are indicated by several titles, including "Our Father", "Blessed", "The Way", "Psalm 23", "The Good Shepherd", and "Soli Deo Gloria." The latter of these is one of the best in the whole set, built on a simple chord progression, featuring a pleasant, direct melody and interesting variations. Two other guitarists, Gerry Putnam and Brian Perry, join Bill on selected tracks to good effect. Listen to "Ghost in the Garden", sporting Putnam's sweet electric slide for a fine example of these collaborations. The instruments are well-recorded throughout - one hears a satisfying growl from the bass strings of Bill Perry's nylon string and chirping overtones from Putnam's electric. Perry's understated approach is perhaps more likely to attract non-guitarists and casual listeners than would-be two-handed tappers and grandstanders, but his music holds promise. I can envision him sustaining listeners' interest in a number of ways: another single-disc collection of instrumentals, writing songs or collaborating with a lyricist, or even writing and performing for film and television. 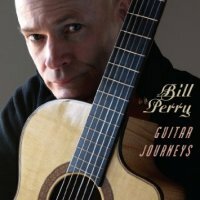 Until then, Guitar Journeys is a very listenable addition to Bill Perry's catalog.